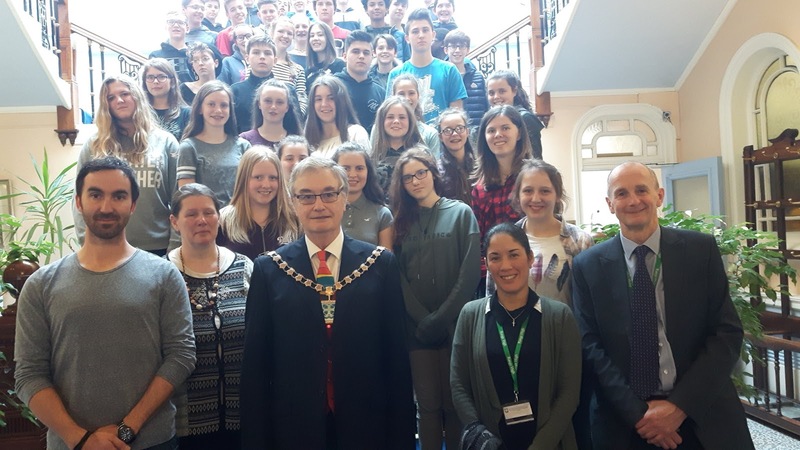 It was a pleasure to meet students from Range High School and from a school from Bavaria in Germany who were involved in a school exchange. They all packed into the Mayor's Parlour at Southport Town Hall at beginning of a tour of the building. We have a well-rehearsed tour of Bootle Town Hall but the Southport one is still of a bit of a 'work in progress'. As we were gathered in the Parlour I was able to show them some of the historical regalia from the Southport County Borough including the Mace and Mayoral chain. We next visited the council chamber. The students from both schools were full of interesting questions and we discussed the difference between a burgermeister and my role as Mayor here. In the anti room to the chamber there is a 'rogue gallery' photographs of former Mayors dating back to the mid C19th which stimulated a lot of discussion.